Chicago’s long-awaited bikeway and elevated park, The 606, opened last weekend (on 6/6, no less) to a rush of pedestrians and cyclists who were eager to test out the new 2.7-mile trail after years of planning, design and construction. The public park remains extremely popular in the sunny week following its debut. 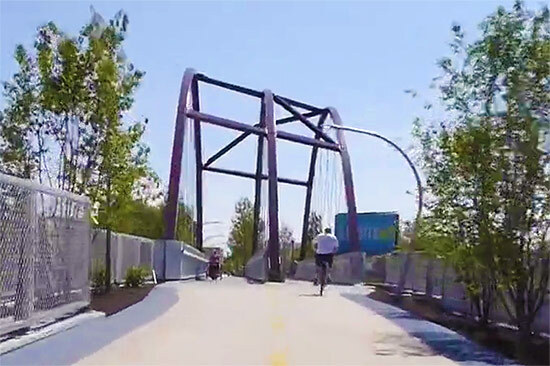 Formerly called the Bloomingdale Trail, the former railroad has been likened to New York City’s High Line, but it is quite different—the 606 is as much a highway for bikes as anything else, due in part to its having been largely funded through the U.S. Department of Transportation’s Congestion Mitigation and Air Quality (CMAQ) improvement program. Lean with it today, #Chicago. Michael Van Valkenburgh Associates led the design of the trail, which slopes slightly at various points throughout its length to slow bike traffic and suggest spaces for community events. Several access points connect the elevated trail to parks and city streets below. Meanwhile with The 606 up and running, affordable housing advocates are worried the popular park could help swell the tide of gentrification sweeping out longtime neighborhood residents.